- Support for earlier releases of 2.0 removed. was looking for something like this for a while now. This should be a core feature. very useful indeed. wish i'd of had this when testing and installing all the mods. I add you polish language. kamili34, thanks for the translation, I'll add it to the package soon. At least one error was encountered during a test installation of this package. It is strongly recommended that you do not continue with installation unless you know what you are doing, and have made a backup very recently. This error may be caused by a conflict between the package you're trying to install and another package you have already installed, an error in the package, a package which requires another package that you don't have installed yet, or a package designed for another version of SMF. 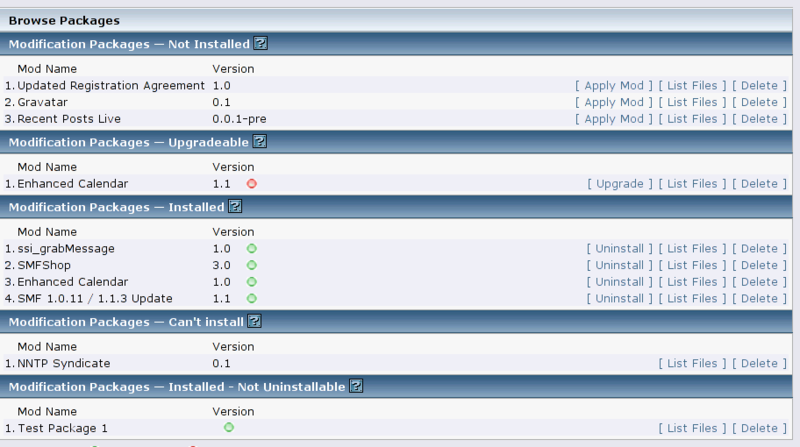 Manual installation into the failed file is required...you can use the automatic install to do the rest. IF IT AINT BROKE, I CAN FIX IT TILL IT IS!! Another great mod from Daniel. Will this work with 1.1.5? Thanks! Will this work whit 2.x? And if not, will it do in the future? I'd like to see this updated to work without modification on SMF 1.1.7. I like to think I know my way around PHP, but I'm not really that comfortable messing with code I've never seen before, especially since it's on a forum for which I don't have access to the files to make backups before I try running my hacked-up install.xml.